A point has no size but simply marks position, says the definition in my head and as used in lessons. Yet if a point is something sharp, such as the blade on Death’s scythe is sharp, it should be better described as an asymptotic limit, in which case the points defining the edge would be themselves undefined. I wonder how sharpness is measured: one imagines that a blade or point has a measurable dimension. I don’t mean image sharpness; Google tells me that the measure of a point’s sharpness is the radius of the end; the test machine I found has only two dozen units extant [www.catra.org] and the test standard is ISO 8442-5:2005. Generally sharpness is governed by the angle of the two opposing faces – and then the radius of curvature of the edge matters (and is worth measuring). Needles are measured in gauge (G), an inverted unit, meaning the number gets bigger as the size diminishes. The tube part of a lancet (regular medical) point has the edges at 15º and there is an ‘A’ grade at 12º . A ‘French’ equals 0.01312 inches diameter and is used mostly with catheters. Fine needles are around 31G, 1/100th of an inch. The finest I have found is a 33G at 0.0080 inches, 0.203mm outside diameter and 0.0035inches [0.089mm] inside. Sadly, this is an inch-based unit. The point, as in “Why are we here?” is an unknown. Apparently many feel the point is to leave your mark, but whether that is on the planet, in history or by some physical damage is not made clear. For some, it is the extension of ones genes: however, given that those with genes worth spreading have small families and are far outweighed by the masses whose genes are sub-median (about half, then) and who have unfettered families, the mathematical law that says things will tend to the norm applies¹. In general, two high IQ parents produce lesser offspring and two low IQ parents produce higher-rated children – tending to the mean (and IQ is a poor measure, but the one available). “Where’s the point?” could be the question of a depressive, and it deserves an answer: If the question refers to the point in life then biologists say that the point is to further the gene pool. That covers a brief period in the life of a human and, if the supposition were the whole truth, renders most of each life an utter waste – therefore the issue (both question and progeny) must be rejected as not being the whole. Equally there is little point in a non-productive life and that then begs the question what constitutes one of those. The British government, especially in the Blair years, was desperate to raise the education levels of everyone, not least to lower or disguise the unemployment figures, but also to encourage people to move between careers by cross-training and by having education at all ages. In China it is taken as gospel that one of the primary duties is to educate oneself to the highest possible level; the US is not far different. Education achieves what, though? How do we use it? What education proves useful in advancing the individual, the nation or the race? Do we all study like mad so as to increase the chance that rare individuals develop something grandly new? [Just how many software programmers does the world need? How many genuine mathematicians?] What is it that we are chasing? Some people chase fame, fortune and happiness, a trio I reckon not to overlap by much. Having tried them all, I recommend the third, though a modicum of the other two can assist. Self-knowledge seems to be a powerful tool in chasing any of these, and those that achieve all three are often pursuing some excellence that appeals internally first, finding a market for their preference that brings the other attributes. Of course, one remains unaware just how many people strive to no similar effect. It would be interesting to measure what constitutes success: I read a book today that said an interesting life is not necessarily a satisfying one²; I would claim though that it makes more opportunity for satisfaction than an uninteresting life. A colleague last year proposed the dictum that one should live life to the full, flat out, squeezing as much as possible into every day – for you know not which is your last. As he put it at the time, if you’re not going to do things, why be here? So for him at least, the point of life was to live it. An economist might argue similarly. The greatest (really? easiest?) benefit each consumer can give is the circulation of wealth; therefore one may argue that we are each beholden to spend and earn as much as we can – to be good little consumers. 1 Usually labelled the Central Limit Theorem, which says that if you take many samples from a population and inspect the means of the samples, then the population of the means is normally distributed (whatever the reasonable distribution of the original, sampled, population. Good students will (should) disagree with my representation. I suspect we have been vague and missed an opportunity to distinguish between central tendency and the central limit theorem. Central tendency is an expression reflecting the generally normal bell-shaped distribution, which will have (has) more of the population near the mode (the average that is applicable). Thus for example with human population begetting children, if ‘you’ (you & the spouse) are off to an end of the distribution, then generally you’d expect your children to be nearer the middle. Small samples make this a pretty rubbish statement, but in general, there will be a tendency towards the mean. 2 No, I have no idea at all which book. I googled the phrase “an interesting life is not necessarily a satisfying one” – and got this essay as the single response. 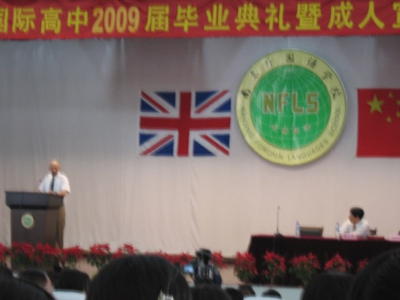 At the end of their school year, Chinese students have a school ceremony not dissimilar from the US equivalent, but far far from any British one. This commentary is based on the occasion viewed in Nanjing this year. The A2 students have completed their exams and indeed have been on study leave since mid-May. This ceremony marks the end of their schooling but, more significantly, includes them being given their ‘graduation’ or completion certificate. This, inevitably, comes in a hard cover so it looks like a little red book (oops), around A6 size, A7 when folded. Inside is a single sheet of official paper (official because it has inked stamps on it) that says the named student has completed their education at the named school in some satisfactory manner. It indicates no grading, only completion. Completion in itself means some minimum standards are reached. I am unaware of anyone being denied completion, so this may well be yet another case where the paper is important but the circumstance is not and the paper itself is of value but somehow the thing the paper stands for is not. Actually, the lack of the paper gives problems, as one is required to have finished (sorry, be able to prove that you have finished) your education. The reasoning is cultural, foreign and I do not claim to understand this at all completely. This essential of the possession of this paper becomes the target and the target is the only lever used in threatening students for bad behaviour over the year. Worse, it appears that the requirements were probably filled a year ago, so only attendance and behaviour could have been at fault. Since no-one is excluded, the threat is patently an empty one. Clearly the threat would be worthwhile if there were transgressors to be held up as examples. The persistent absentees and the proven cheats still received their ‘diplomas’. So what is the worth? I do not understand this thinking. I do, of course, have a fundamental disagreement with the idea of ‘graduation’ from school. I begin to understand that there must be a paper marking the exit from school, but I disagree at so many levels with the idea of entitlement to wear a gown and hood and mortarboard. I might think differently if the qualification was graduated (literally, grades given) or was even selective, but the limit of selection lies in getting into the school. So you can imagine how I feel at the students wearing a gown of at least exhibitioner (commoner, exhibitioner, scholar, graduate) rank, being a long gown, the greater annoyance at the gaudy (apologies to Oxonians, there) hood: the mortarboard I can disregard as the result of a misunderstood American influence (instantly denied when I suggest this). I notice the footwear and realise that the great heat and humidity mean that these students are wearing surprisingly little – it is not uncommon for there to be shorts, T-shirt and sneakers with the gown. Very few are wearing ‘proper’ dress at all so I stop being narked and try to be amused instead. The performance starts with a grand entry to the lecture hall. A number of rows in the middle section have been kept clear and the students parade in to fill alternate rows from opposite directions (neat, if they’d moved at closer intervals). The room is otherwise filled with parents and other students. On the stage are three staff: the Head, myself and a lady who has come only for the first part of the official content. But first, having survived the entry process, we have two compères explaining and introducing. They do this well. We sing the National Anthem, facing the flag on the wall at the back of the stage. 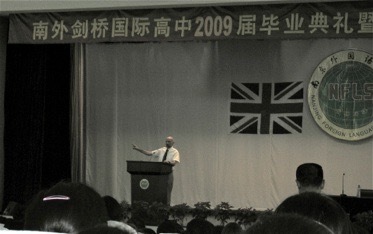 The stage also has the UK flag and a huge version of the school crest (it must be close to 3 metres across). Then we have the official lady visitor, who takes the kids through the oath of adulthood (my descriptor) and then vanishes from the stage. Next up is a picture file of memories which is repeated on screens around the room but does not include one that the Head and I can see, so we look consistently stupid, especially when (if) there are pictures of ourselves. I now have a file that may be what was shown, in which many of the pictures are over a year old and so appropriate to this cohort. Speeches follow the laughter. 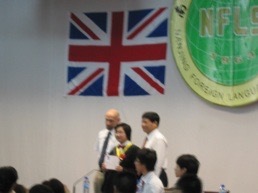 The Head, myself, a representative parent, a student in Chinese and a student in English. Each is bracketed by a bow to the audience. I am informed later that mine was perhaps too difficult – (not the bow, the content) but I insist on saying something rather than contribute only froth. Endured, not enjoyed. Throughout this phase there are people of all descriptions wandering around with cameras in a range of sizes as if showing what the market has to offer. 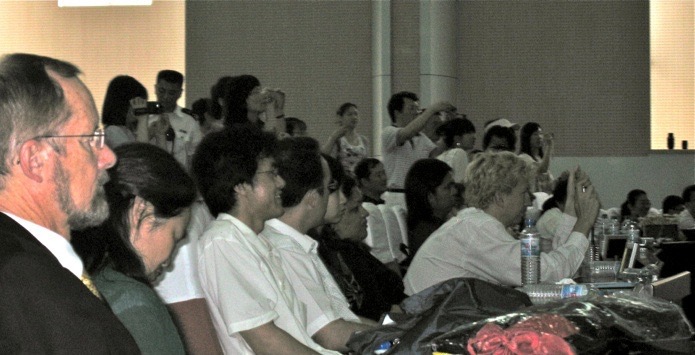 For me the best picture is of the audience, itself largely behind a camera; my copy is of low quality. Then we have the handing out of the diplomas. 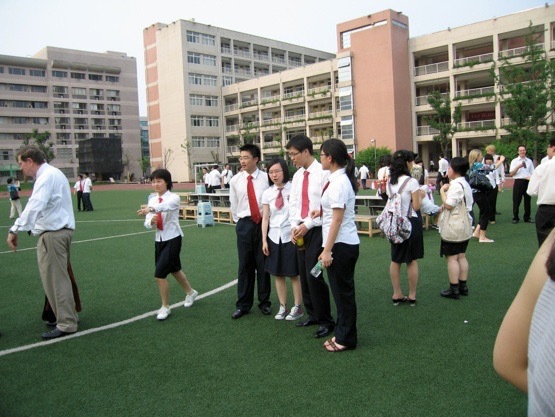 The kids are formed up in a queue to one side of the stage; they must take maybe ten steps, shake my hand, shake the Head’s hand, collect the little red book from the Head and hold it against their chest while a photo is snatched of the three of us – and vanish fast before the next student arrives. As the Head said at the time, doing this for 70 is one thing, but he had to do it for 400 last week. The kids manage to screw this simple task up by lack of observation of the therbligs (look it up). They need to grab my right and pass in front of me to meet the Head from the right angle. They need to collect the diploma with their left; they need to face the camera. They don’t want to fall over, drop anything, have any clothes fall off: their moment is recorded by the official photographer and by a host of amateurs standing on the apron of the stage – largely parents, but the number taking many photos is confusing. The lack of familiarity with the form of dress shows. I see how few can tie a tie, how many have a clip-on tie, how many can’t even fasten their shirts. I marvel at the range of clothes being worn (or not) and I realise that some of these ‘shirts’ are only as complete as the little piece that is visible, maybe as much as an handkerchief. After this, we move to more photos indoors. The school's official photographer shows me briefly some he snatched in an off moment – my, he is good. The parents and students grab any and all staff for paired photos with their preferred adult, often trading cameras in pairs. This continues outside—an official year-group photo will demonstrate who of the staff was missing—and the photos continue for a further hour. During this time I am invited to dinner with the departing kids – a singular honour. This proves to be great fun and demonstrates a side of the kids I had not expected. While too many drink too much too fast, they stop at a point well within the bounds of good behaviour and no-one misbehaves. Yes, they are loud and rowdy but much less so than the equivalent UK kids. There are several muted apologies to the restaurant staff (now there’s a first) and quite a lot of rotation between tables as people manage to achieve a mingling that would not happen in the west without serious external effort. Conversation is wide-ranging and varies between the really intelligent and the uncouth banter, but with an unexpected distribution that would not be matched on other continents. I am impressed with the students. I definitely enjoyed the company. Is this graduation? Of course it isn’t, and we all need a better word to describe the event and to mark the passing and its rites. There was very little silliness and much decorum. While several went on to party the night away, this was also done with a forethought I had not anticipated but am very glad to have seen. Don’t the kids look ever so young? Cris Miller doesn’t look the 70 he was at the time and C [inset, demonstrating a bar move, I think] is not usually anywhere near his size.